Google’s Web Fonts collection of open source fonts is now available on the desktop (Mac and Windows). At first glance, that doesn’t make all that much sense, given that the whole idea of Web Fonts is that they bring new typography options to the Web that were previously only available on the desktop. As Google notes, however, having these fonts available locally on your desktop means that your browser doesn’t actually have to spend time fetching them over the web. 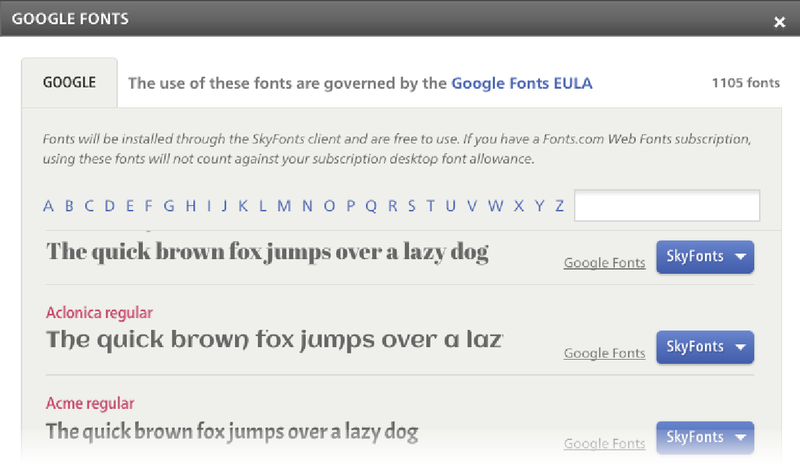 Google is using SkyFonts, a tool from font specialist Monotype, to allow you to install these fonts. The advantage of this, the company says, is that this tool also ensures that the fonts are regularly updated when new characters are added or the designers make other changes to it. Google launched Web Fonts in 2011. The service currently offers access to over 620 font families and all of these, of course, are now also available on the desktop. When it launched Web Fonts, Google said that it was doing so to free designers from having to use Flash or embed text in images to bring better and more interesting typography to the web. Google is obviously just one player in this market. Adobe, for example, offers similar features with its freemium TypeKit service and Edge Web Fonts for free and open source fonts. It’s also worth noting that many of the fonts available through Google Web Fonts were already available for the desktop.